In case you can't make our June 7, 2011 recording, we're offering this second live recording as an alternative. The 45 minute presentation will feature the same content as the June 7 recording, however due to the nature of having a different live audience, the Q & A session will be one-of-a-kind! 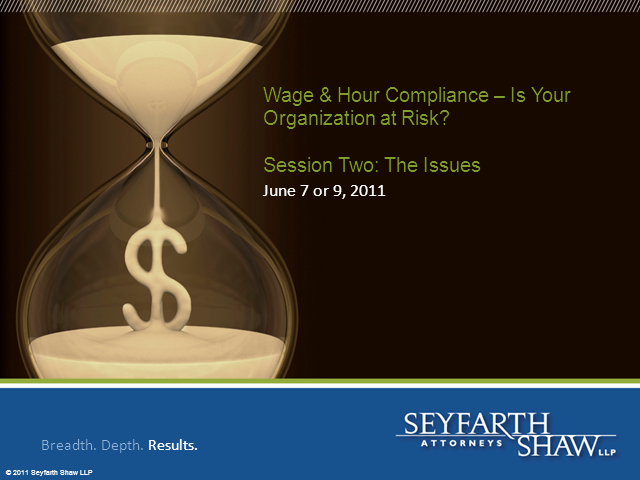 Part two of the Wage and Hour Compliance Series, Session Two - The Issues, will give you a legal explanation of the top 10 issues employers will face, including travel time, rest and meal periods, donning and doffing, waiting time, training and orientation, etc.